Introducing the latest aftermarket cross-reference technology. 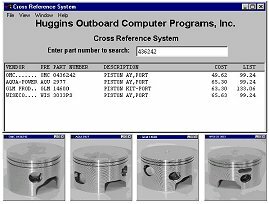 Simply type any aftermarket or OEM part number and our computer program can provide you with valuable alternative part numbers, costs and even images. No longer spend time searching through paper catalogs for equivalent part numbers. A picture is worth a thousand words.